The Fungus Federation of Santa Cruz (FFSC) transformed the Louden Nelson Community Center into a mushroom wonderland this weekend. 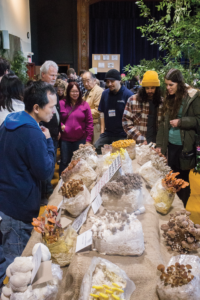 The Santa Cruz Fungus Fair is the largest fungus fair in the country, with everything from a kids’ room with stamp making, tie-dying and face painting, to packed lecture rooms and booths selling fungi starters and craft kits. The FFSC event aims to inform the public of the many uses of mushrooms and the crucial role they play in providing stability and nourishment for the forest ecosystem. The three-day fair drew over 2,500 attendees. This is the 43rd anniversary of the event. White, along with several others in attendance including Brooks Worden, spawn production manager at Far West Fungi and member of FFSC, became interested in the field through food. Worden said Far West Fungi specializes in all things fungi, including selling dietary supplements and truffle honey mustard at farmer’s markets all over the Bay Area. Beyond their culinary use, mushrooms are necessary in maintaining a delicate balance in their natural habitat. Capable of filtering out toxins in the ground and breaking down decaying trees into nutrients for the soil, fungus serves as a crucial element to forest ecosystems. The Santa Cruz area provides a unique ecological environment that is perfect for growing mushrooms. Over 300 species of fungi were found in Santa Cruz county last year alone. Though that number is slightly lower this year due to the overall lack of rainfall, public interest in mycology — the study of fungus — grows. Mushrooms are making great contributions to recent technological developments. A future of mushroom-based technology is being shaped in the form of computer chips that could be made from extracted metals in mycelium — the fibrous roots of the mushroom — and the construction of durable, biodegradable furniture, among other inventive products. Much of the information about these technological advancements and the specific benefits of mushrooms are new to people outside of the community. 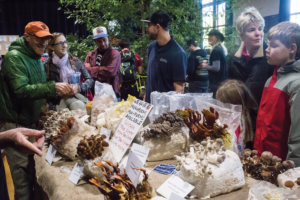 Festival newcomers Jess Fan-Brown and Daniel Carr, both second-year UC Santa Cruz biology students, came looking for expert advice about mushroom identification, cooking tips and foraging advice. It is not uncommon for new mushroom hunters to be discouraged by a lack of knowledge about where to look and what to look for. Among the main deterrents for those outside of the mushroom collecting community is the risk of ingesting poisonous mushrooms. The community center walls were lined with posters differentiating dangerous mushrooms foragers should look out for and those which are safe to eat. But UCSC ecology and evolution student and minister of science for the FFSC, Christian Schwarz, said the fears of poisonous mushrooms are overrated. “Practically any other hobby is more dangerous than mushrooms, provided you don’t eat every mushroom you find,” Schwarz said. “It’s a matter of approaching it consciously.” Despite an initial disgust for mushrooms as a food, Schwarz became fascinated by fungi after a particularly fruitful rainy year. 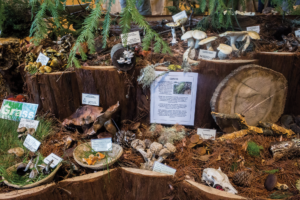 Upon their arrival, guests were greeted by a habitat display with detailed information about an array of poisonous, medicinal and “weird” mushrooms. Placards identified each body of fungus by its scientific name, color and location, among other mushroom-specific fun facts.